I attended the 2016 Gooch’s Garlic Run earlier this month. I have written about this annual event before. 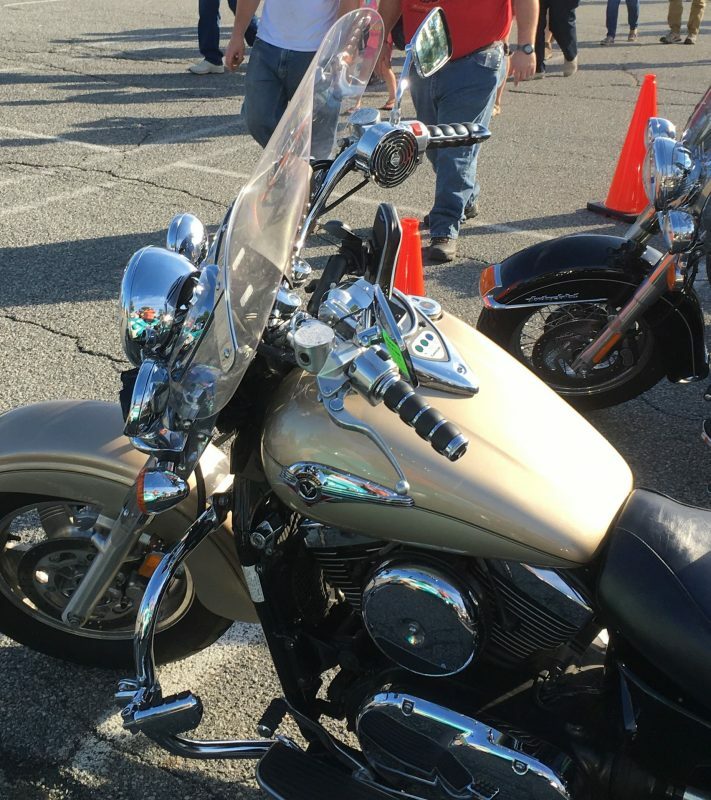 It’s for a good cause and each year a few thousand bikers show up for the annual ride to downtown Newark. There were a few Kawasaki Vulcan models present and I snapped a photo of one so I could write a good article. So, here’s our article about mounts and holders for Kawasaki Vulcan motorcycles. The photo that accompanies this article shows the Kawasaki Vulcan. This is another easy motorcycle for mounting a phone or GPS. Lots of handlebar space. Also a few other opportunities. I like to recommend mounts that don’t require drilling holes or making major modifications so we will stick with that principle in this article. Nothing special about the diameter of the Kawasaki Vulcan handlebar. It comes in at a standard 1.25 inches in diameter. There’s lots of handlebar real estate on each side of the stem. This is great news for people who like to mount devices on their handlebar. Handlebar mounts are easy to install and remove. I used to open motorcycle mount articles with a discussion about GPS devices because that’s what everyone was mounting. With the introduction of excellent GPS apps for smartphones, these devices now outnumber GPS units so I’ll start the mount discussion with those for smartphones. By the way, if you haven’t tried it, check out our Waze review. I think that’s the best GPS app out there. It’s important that you select a mount that has a well constructed cradle to hold your phone tightly so that it stays secure in high vibration environments. The RAM X-Grip line of mounts continues to a be one of my favorites for motorcycle use. We wrote a very detailed article on the X-Grip series which you can read here. Most smartphones, especially with a case or skin, can use the RAM X-Grip IV Handlebar Mount. These are heavy duty mounts that are mostly constructed of metal. The mount has gone through some rigorous shake tests and holds up well on a motorcycle. These mounts feature the expandable X-Grip IV cradle which can open to 4.5 inches which is large enough for almost any phone. These mounts attach to your handlebar and allows complete 360 degree rotation of your phone. The manufacturer now includes a safety tether with these mounts which is a nice added feature. These come with a lifetime warranty from RAM. Most GPS owners are using a Garmin GPS. Either a Garmin Zumo or one of the car models like a Garmin Nuvi or Garmin Drive. The Zumo includes a RAM Motorcycle Mount with 4-Hole Adapter that will attach to your handlebar or clutch. The Garmin Nuvi or Garmin Drive use a cradle that has a 17mm socket on the back. You will use a mount that has a 17mm ball on it. We recommend tethering the GPS to your handlebar if possible for added safety. On the Nuvi or Drive, you might be able to use the X-Grip mount we recommended for a phone as well. Some Kawasaki Vulcan models such as the 1600 or 2000 can use the RAM Motorcycle Brake/Clutch Reservoir Cover Base with 1″ Ball Offset. This base would replace the handlebar part in either of the two mounts we just described. These attach to the reservoir cover using the screws that are provided. These screws replace the ones that came with your Kawasaki Vulcan. It’s an easy install but be sure to follow the directions from RAM. A higher priced but better made handlebar mount is the Arkon Premium Aluminum Motorcycle Garmin GPS Motorcycle Mount. These will fit your Kawasaki Vulcan handlebar just fine and like the previous mount, it has a 17mm ball on the end. It’s made of metal and installs with the included hex wrench. Keep the wrench in the saddlebag when finished because you will lose it if thrown into your garage toolbox.